Summer in New England has so much to offer, but sadly it can be a time of major stress for working parents. When school gets out in June, parents need a safe, fun, and affordable place for their kids to spend the day. 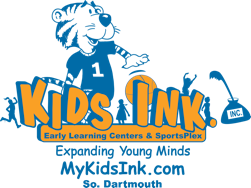 Kids Ink Too is the place to be all summer long! Our summer programs for school age children are structured more like camp than daycare. Scheduling is very flexible, so parents can find an option to meet their needs throughout June, July, and August. Each week all summer has a theme. Children enjoy sports and fitness activities, cooking, crafts, and education surrounding each weekly theme. Children enjoy many field trips throughout the summer. They also have opportunities to volunteer in the community. To keep academic skills fresh, reading and math concepts are reviewed with games and challenges. This way, kids retain more of what they have already learned, and are better prepared for the upcoming school year. We encourage parents to make summer plans early, as our programs have become very popular, and space will be limited. We will make accommodations whenever possible, but call (774) 929-6565 to inquire or reserve a spot!